I’ll be the first to admit: I wasn’t the biggest fan of the original God of War games. Don’t get me wrong, Kratos’ journey for revenge against the Greek Pantheon was well-worth playing, but the non-stop flow of bloody action and over-the-top boss fights was (sometimes) a lot to swallow. Granted, I didn’t pick up my first PlayStation console until 2010, so that might have had something to do with it. On the other hand, I’ve been anxiously awaiting the release of 2018’s God of War, though for the longest time, I couldn’t fully explain why that was. Perhaps it was the shift to an exploration Norse mythology? Or maybe it was the series’ new focus on storytelling and narrative, as evident from the trailers we’ve seen leading up to the game’s release. Having finally played it, I can safely say it was for all those reasons, and plenty more too. Speaking of those trailers, if anything has been made clear, it’s how much the series has changed in its transition to the current-generation of consoles. Putting aside graphical fidelity for a moment, there’s no point in ignoring the biggest (and most noticeable) change; that is, the change in perspective. Unlike previous games, God of War pulls the camera in close and tight, spending most of its time a few feet behind Kratos’ back. On the surface, one might think that this was done solely for the purpose of storytelling, but it turns out it has more ramifications once you dig a little deeper. For starters, its made combat a much more intimate affair. Rather than panning back to allow players to juggle and crowd control an onslaught of enemies, the action is always up close and personal. As a result, combat has been largely overhauled. Swapping chained blades for the ever-useful Leviathan Axe, players will no longer find themselves mashing buttons with reckless abandon, but rather carefully choosing their attacks to best fit the task at hand. At the onset, you’ll mostly be mixing up light and heavy attacks, but after a few hours, you’ll have a handful of ‘runic attacks’ at your disposal, such as a freezing spin attack or a crowd-dispersing push. A few more hours in and you’ll be able to outfit the Leviathan Axe and armor with new handles and enchantments, These provide passive perks, as well as the occasional stat buff if you fight effectively in battle, like pulling off well-timed dodged or parries with your shield. God of War isn’t afraid to continually drip-feed players new mechanics and moves, and it wasn’t until I was a dozen or so hours in that I unlocked a talisman that slowed down time upon pulling off a last-minute dodge (not unlike Bayonetta’s Witch Time mechanic). Seriously, I cannot overstate just how diverse the game’s combat system is, and I have no doubts that players will be tweaking their loadouts and upgrading their armor all the way up until the game’s finale. I could probably spend a few more paragraphs rambling on about the stellar combat, but I’d be doing the game a disservice if I didn’t move onto the other big change: Atreus. This time around, Kratos will be journeying with his son in tow, which lends a grounded and more serious tone to the proceedings; a far cry from the never-ending blood baths that defined Kratos’ past life in Ancient Greece. Atreus isn’t afraid to lend his father a hand in combat, and while he might start out slow, it doesn’t take long before the father-son duo are calling out incoming enemies and pulling off tag-team moves in style. While Atreus will move around the environment and hold his own in battle, you can command him to shoot arrows with a quick button tap, which has the added benefit of stunning enemies (more on that later). But to be honest, Atreus is far more interesting away from the battlefield, when he’s not just another cog in the well-oiled machine that is God of War’s excellent combat. Having just lost his mother, Atreus is accompanying Kratos to the top of a nearby mountain, where they plan to spread her remaining ashes. It doesn’t take long to surmise that Kratos might not have been the most devoted father in the past few years, and although he’s shed much of his anger since his days as a Spartan warrior, its clear that he still has trouble connecting with his son. 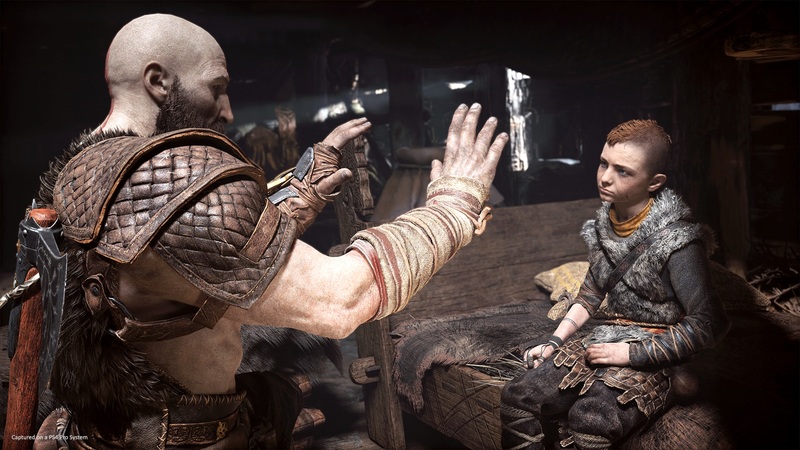 There are plenty of scenes throughout the game where Kratos is clearly trying to find the right words to comfort or relate to Atreus, but he often falls short of the mark with a loss for words, or worse yet, a rather callous and cold response. If anything, Atreus is a sort of stand-in for the player; eager to continue exploring the world, interested in learning about the lore of the land, and quick to jump into battle. As you might imagine, this contrasts sharply with Kratos’ steely demeanor, and needless to say, it makes for some great dialogue between combat encounters and cutscenes. All of this makes it easy to stay invested in the ongoing story, and part of that comes from the game keeping you in the dark for a majority of the campaign. How exactly did Kratos find himself in this new world? Why did his late wife want her ashes spread on the highest point in all the realms? Why is a mysterious Norse stranger with god-like strength pursuing him and his son, and how does everyone know about Kratos’ mysterious past? God of War isn’t afraid to keep you guessing, and if you’re anything like me, you’ll keep playing just to find out how it all pans out. Still, for all that has changed in this newest installment, developer Santa Monica Studios hasn’t completely rewritten the series DNA. There are still plenty of hidden chests to track down, and puzzles that bookend enemy encounters. Brutal kills and executions are still available for those who enjoy them, but this time around, most of them are triggered by stunning an enemy enough, as opposed to whittling down their health. 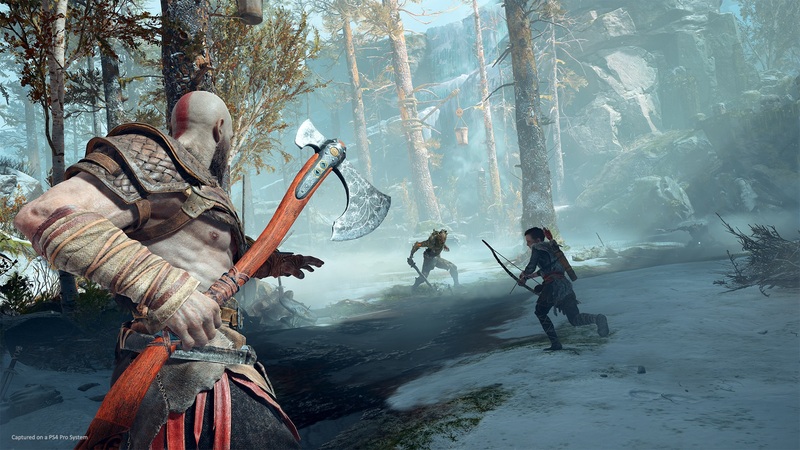 In fact, this allows for some variety in how you approach combat, as Kratos’ Leviathan Axe damages enemies normally, while bare-knuckled attacks and shots from Atreus’ bow impart ‘stun damage’. For those willing to try it, you can even defeat entire bosses without swinging an axe even once, assuming you can chain together enough stun attacks in quick succession. 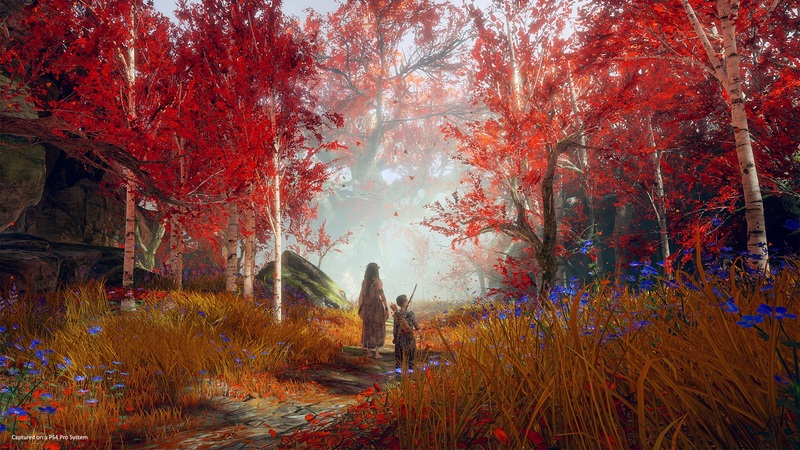 While the core, story-progressing quests are still fairly linear in nature, the entire game unfolds in a connected ‘hub’ world (similar to the recent Tomb Raider reboots), which you can explore at your leisure. Of course, much of the world is blocked off until you obtain a key item or unlock a specific ability, but with (quite literally) hundreds of collectibles to track down, as well as numerous side-quests, you’ll naturally find yourself backtracking to old areas, even if it doesn’t progress the main story. As a self-described graphics technology junkie, I’m surprised I managed to go this long without mentioning the tech responsible for the gorgeous visuals on display. Taking full advantage of the increased power of the PlayStation 4 Pro, God of War outputs a 4K/2160p image through checkerboard rendering, though Santa Monica Studios has (somehow) eliminated a majority of the checkerboard artifacts that we’ve come to expect. Individual assets and textures are extremely well done, and Kratos himself is beautifully modeled, with tons of fine detail across his armor and clothing. The same goes for the rest of the characters and enemies, thanks in part to the physically-based renderer being used. God of War also makes use of plenty of GPU effects and particles, with the volumetric lighting and fog really standing out. This is all backed up by a (fairly) steady framerate and an excellent implementation of motion blur. It would have been a shame if the game had stuck to muted earth tones and colors for its duration, but to the developer’s credit, you’ll be whisked off to various worlds throughout the story, many of which make wonderful use of color. Somewhere out there, I’m sure there are diehard series fans who are crying foul at the new direction the series has taken, and I can’t help but feel sorry for them. From its renewed focus on storytelling, to its stunningly gorgeous world and incredibly satisfying combat, God of War is nothing short of a masterpiece, one that sets a new bar for what can be accomplished in the world of AAA games. This review is based off time spent playing on a PlayStation 4 Pro. A review copy was provided by Sony Interactive Entertainment of America.